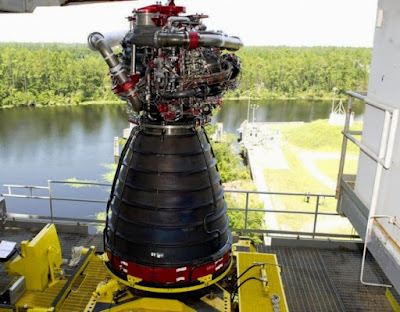 Engineers at NASA’s Stennis Space Center installed an RS-25 rocket engine at the facilities A-1 Test Stand this week, and are ready to begin a series of developmental tests on what should be the main power source for NASA’s deep-space launch vehicle, the Space Launch System (SLS ). This RS-25 engine, called No. 0525, is a newly modified version of the main engine that was used for more than 30 years on NASA’s iconic space shuttle program. Four of these modified RS-25 engines will power the core stage of NASA’s SLS rocket, and this upcoming testing will be vital to confirm the effectiveness of upgraded engine components and other systems. “Installation of RS-25 engine No. 0525 signals the launch of another major rocket engine test project for human space exploration on the A-1 Test Stand,” said Gary Benton, RS-25 rocket engine test project manager at Stennis, in a statement released by NASA. The primary system being evaluated is the RS-25’s new advanced engine controller. This internal system acts as an onboard regulator that directs the flow of mixed liquid oxygen and liquid hydrogen fuel, which are the propellents for the rocket. When this engine fires for the first time, and the “hotfire” testing officially begins, the engine controller will also evaluate the high amount of thrust generated, which will be essential to achieving liftoff and traveling beyond low-Earth orbit (LEO). The test stand at NASA’s Stennis Space Center, where engine No. 0525 is currently waiting to be put through its paces, is a historic location for the space agency. It was originally built to test the Apollo-era rocket engines back in the 1960s, and will now be used to develop the engines used for NASA’s next great leap into space. SLS will serve as the launch vehicle for NASA’s Orion spacecraft, designed to take humans on future missions that include, the Moon, a captured asteroid, Mars, and beyond. Testing is set to begin in the coming weeks, and on top of other successful developmental projects over the decades, this test stand has undergone over a year of modifications to prepare the structure for the RS-25 engine. “Another upcoming milestone for SLS is putting the final touches on the Vertical Assembly Center (VAC),” said Rachel Kraft, a public affairs specialist at NASA Headquarters in Washington. The VAC will be one of the largest welding tools ever constructed when it’s completed later this year. VAC, along with several other tooling stations located at NASA’s Michoud Assembly Facility in New Orleans, will be used to construct the 321-foot tall SLS rocket body, with a welding technique called “friction stir welding” that creates a nearly seamless surface area. When development on all the components and systems for SLS is completed, they will be integrated into the “Block 1 variant” and flown on the first SLS flight-test called Exploration Mission 1, which is currently scheduled for some time in 2017.